All American Foods, Inc. is a food distribution company headquartered in Rhode Island, USA. The company is engaged in the production of a variety of seafood, meat and deli products. 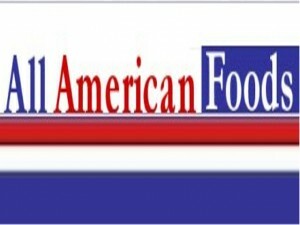 All American Foods was founded in April 1988 by Leon Panteleos under its original name All American Meats and Seafood Incorporated. Panteleos started his business when he bought Madeiros Meats, a company that engaged in processing different deli and meat items. When Madeiros Meats was purchased, the company had yearly sales of about $240,000 and was operating from a residential garage. The only storage was a 6×6 freezer and a 10×10 refrigerator. In April 1989, the company moved to a building with an area of 1,000 square feet that included a walk-in freezer and walk-in refrigerator. In February 1993, the company moved again, this time to a 2,500 square feet facility containing a walk-in freezer, walk-in refrigerator, as well as a loading dock. At this point the company was earning roughly $5 million in total. In 1999, Panteleos moved the company for a third time to the area of North Kingstown, Rhode Island. This new location and facility had an area of 50,000 square feet and was a multi-temperature building with an off-load rail. The facility also had a 60×300 square feet dock. During this time, the company’s earnings were around $20 million. The company’s name was changed to All American Foods in 2003 at which time it had also completed its expansion, allowing it to double its previous size. In 2006, All American Foods doubled its facility’s freezer capacity with the addition of a new industrial freezer. Since its inception, the company has enjoyed incredible growth, accumulating a large customer base and about 8,000 SKUs. Currently, the company is again looking for another location, one that would be able to accommodate larger production demands. Today, All American Foods Inc. is Rhode Island’s biggest independently-owned distributor of meats, seafood and deli products.